Steve is a professional trombonist and electric bassist with over 40 years of performance and teaching experience. He has performed for numerous National Broadway tours, North Carolina Theater, the North Carolina Jazz Repertory Orchestra, the North Carolina Ballet, the North Carolina Opera Company, the North Carolina Symphony, the Guy Lombardo Orchestra, Frank Sinatra Jr., Michael Feinstein, and many others. Steve is also a professional arranger, copyist and composer. 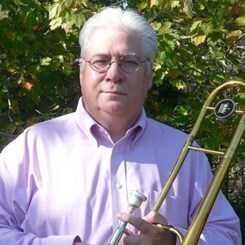 Steve studied trombone with John Riegger (Principal Trombone, Dayton Philharmonic), Earl Hoffman (Bass Trombone, San Antonio Symphony), Thomas Streeter (Low Brass Professor, Illinois Wesleyan University), Keith Jackson (Professor, West Virginia University), and Michael Kris (Senior Lecturer, University of North Carolina). Steve has had additional study with Keith Brown, Frank Crisafulli, Slide Hampton, David Baker, and Phil Wilson. He possesses a Bachelor’s degree in Music Performance from Illinois Wesleyan University.